Here's why those legendary taildraggers from Georgia keep flying out of factory doors. Fifty years later, Spence Air Base doubles as a fairground. Taxiing to the nearest runway is now a 10-minute affair of nosing through chain-link gates, slaloming light poles and picking between the buildings that house Moultrie’s Agricultural Exposition. The company’s reins have changed hands through the generations, but the Maule aircraft design remains soundly fixed, with a few nods to modern technology and innovation to improve its designs. Maule’s MX-7-180B demonstrator recently took wing sporting a few backcountry modifications as the company tailors the design to customers’ needs. The passion for slow-flying machines came early for Maule. While enlisted in the U.S. Army, he became a mechanic on dirigibles, and at that same time he designed and built his first airplane, the M-1. With its 27-horsepower coming from a motorcycle engine, the M-1 looked more like a Bleriot monoplane than the Maule of today, but it was a solid beginning for a man whose passion for flight and knack for inventions kept him in business for life. A mechanical starter design opened his first business; his later designs of tailwheel mechanisms and fabric testing tools helped Maule’s products find use by operators of airplanes from many manufacturers. In 1952, B.D. Maule began designing the M-4, which took flight in 1957 and received certification in 1961. In 1968, the Maule family moved from Jackson, Michigan, to their current home in Moultrie, Georgia. Located on the former Spence Air Base, the factory continues to hand-build utilitarian aircraft that haven’t changed a whole lot since its inception — and while it isn’t setting any records with its production numbers, the production line hasn’t stopped since its first bird rolled out the front door. That’s something few of the industry giants can say about their single-engine product lines. And as the locals in South Georgia will tell you, it ain’t bragging if it’s true. After Maule died, aged 83, in 1995, the company continued under the leadership of his bride, June, until her passing in 2009 at age 92. Their son Ray headed up the company until his death in January at age 83. Today, a much younger face runs the show. Brent Maule, Ray’s son and B.D.’s grandson, heads the operation. The plant employs about 30 people, including some young faces who are the fourth generation of the Maule family in the business. To date, Maule has produced just shy of 2,600 airplanes, with power ranging from 145 to 420 horsepower, with engines made by Lycoming, Franklin, Continental and Allison. 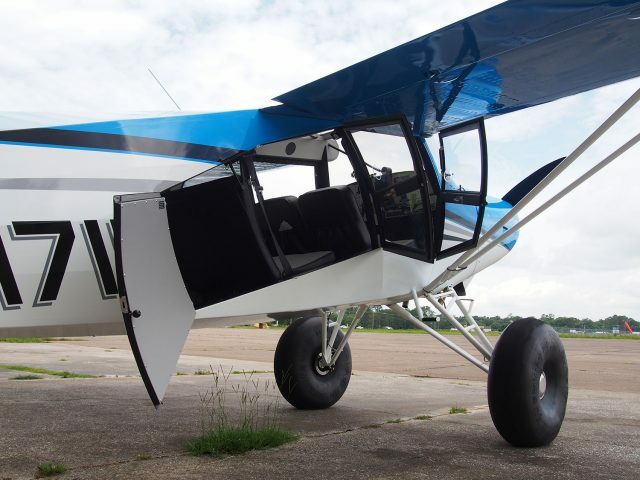 You can order up a taildragger with spring or oleo gear or, if need be, a nose wheel. Floats and skis are options. The M-9’s deeper fuselage allows for a fifth seat in back. They’re flexible on panel equipment. Maule has been called the “Mister Potato Head” of aircraft manufacturers owing to the interchangeability of major components to custom tailor airframes to its customers’ needs, and that flexibility has helped keep them in business all these years. The Maule MX-7-180 is a simile and incredibly capable airplane built tough. A big drawing card is its double side doors. The MX-7-180B is Maule’s base model. With four seats in the standard arrangement and an easily removable rear seat, the MX-7 can quickly swap between a four-seat family airplane and a backcountry camping or cargo hauler configuration. The two doors for the rear seat and cargo area are both on the right side of the fuselage—the door for the rear seat opens forward, and the cargo bin door hinges aft to create an opening that will accommodate any reasonable load. The 42-inch cabin width at the shoulders is 2.5 inches wider than a Cessna Skyhawk. A carbureted Lycoming O-360-C1F pushes 180 horsepower through a Hartzell 76-inch constant speed prop, offering reliability and ease of maintenance with a firewall-forward section familiar to nearly any FBO mechanic. The structures are conventional, maintainable and rugged. The wings are strut-braced aluminum; the fuselage and tail feathers are steel structures covered in Ceconite fabric. The stock panel sports a standard, analog six-pack and a JPI 930 engine monitor. Maule’s small-volume production allows each owner to tailor the panel to their individual needs. Basic VFR and IFR panels are installed in-house, while advanced custom IFR panels are generally installed after ferrying to an avionics shop. The demonstrator flown for this review sported a clock, airspeed indicator, altimeter and compass, an EDM engine monitor, transponder and comm radio, along with an AirGizmos dock for a Garmin Aera 660. The minimalist panel saves pounds of weight that might otherwise be used for fuel, people or cargo. For low-time Maule drivers taking a demonstration flight, it means that a quick glance at the panel will never yield extraneous information. When the only needles in front of you are airspeed and altitude, you won’t be hunting for the right instrument. Maule interiors are functional and simple. The seats are fabric, with leather as an option, and the heavy-duty carpet won’t protest when using a shop vacuum on muddy footprints. There aren’t a lot of plastic pieces to break when wrestling something heavy into the back. The manual flap handle, trim wheel and vertical column for the flight controls occupy the space between the pilot’s right leg and the front passenger’s left leg. On the sidewall by the pilot’s left knee, the three-position fuel selector offers selections for off, or either or both of the 21.5-gallon left and right tanks. The auxiliary tanks offer another 21 gallons of useable fuel, which is transferred into the main tanks via electric fuel pumps. That 85-gallon fuel capacity gives the MX-7 long legs but requires that you pay attention to the fuel load when hauling anything more than two adults. With full tanks, 510 pounds of fuel eats up almost half of the airplane’s 1,030-pound useful load. The endurance the main tanks offer is plenty for most owners and operators. Once Cessna drivers learn to temper those “top her off” fuel requests to “mains only,” the problem is solved. All four fuel tanks are metal and removable, bypassing the long-term maintenance woes of a leaking sealed wing or dry-rotted rubber fuel bladders. Maule offers a multitude of choices for landing gear. Within the MX-7 family, the MX-7-180B has an oleo absorber gear with a 6-foot track that offers light weight, an option for extended gear legs, and the spacing between the main wheels matches well with wheeled vehicles if your backcountry needs include landing on roads. The MX-7-180C sits on an aluminum spriung gear with a wider stance at 7 feet, 10 inches but weighs 75 pounds more than the B model. If you’re worried about ground handling, the MXT-7-180 couples the sprung aluminum gear with a nose wheel to help with ground handling and insurance. Main wheels are available from the stock size of 7.00-6 through 35-inch bushwheels. The tail of the demonstrator is perched on an Airframes Alaska Baby Bush Wheel. A quirk of the Maule family is worth noting: Flaps 0 and Flaps up are not the same thing in a Maule. In cruise, those wings are creating enough lift that the nose-low attitude to maintain level flight creates additional drag. In cruise, the flaps are reflexed seven degrees up to cancel out excess lift and put the nose back on the horizon, gaining a few knots in cruise. As you grab the handle and start pulling, the first click stops the flaps at zero degrees, used for normal climbs. The second notch, at 24 degrees, is used for takeoff and best-angle climbs over an obstacle, while the third and fourth notches at 40 and 48 degrees, respectively, are used for landing. If you’re the type who paces off a field and hits the slide rule for performance calculations, prepare for an anxiety attack. The Maule POHs, all of which are available for download online, have no performance tables, and the checklists are correspondingly brief. The "V" of tubing basically disappears from one's consciousness moments after taking the controls of the Maule MX-7-180. Given the bush wheels and extended gear legs, climbing into the cabin is a daunting task for first-timers. To climb into the seat, start with the gear leg’s step, then grab the steel tube over the glareshield, swinging in while using the seat back as a balancing point. The engine starts just like any other carbureted Lycoming: Mags on, mixture rich, prime if needed, and turn the key. Taxiing out from the Maule factory, the visibility over the nose is surprising: Even with the nose pointed skyward on the big tires and long gear legs, the view isn’t bad. Looking straight ahead, you get enough view to see the centerline well ahead, although you’ll want to S-turn or lean out the window to see anything very close and ahead, such as when the neighborhood dog trots out to say hello. Foregoing a long taxi to the runway, Maule factory pilots instead use the ramp in front of the hangar as a runway, which is ample for their needs. With a notch of flaps deployed, we powered up, dropped the brake and launched. Despite being the lowest-powered offering from Maule, the acceleration was appreciable as the prop turned up toward 2,600 RPM. Maule demo pilot Kit Wilkes pushed the nose briskly to level, then, as we reached flying speed, he hauled back with the assertiveness we’ve come to expect after watching Valdez STOL contest videos. The tailwheel thumped back to the asphalt for half a second, then we clawed into the air, clearing pine trees and powerlines by a comfortable margin. The stall horn chirped a few times in the initial climb, but the wings gave no indication of quitting as we climbed out just shy of 50 knots with a steep nose-up attitude. There’s no VSI in the demo ship, and the broken layer of scud meant we leveled off quickly. Maule claims a climb rate of 1,000 feet per minute at gross. We were about 450 pounds under gross with two pilots and half tanks in the mains, and nothing but air in the aux tanks. The 85-degree June morning in Georgia’s sultry humidity was far from standard, but working planes don’t wait around for standard days. Visibility in cruise is excellent, and a full-sized Plexiglas cabin roof makes the cabin seem even larger than it is. A retracting sun shield overhead helps to cut down on glare when needed. When rolling into a turn, the seating position behind the wing’s leading edge does present a limited view, but looking before turning quickly becomes habit. The front door windows can be opened in flight up to 120 knots; window cutouts and built-in cabin vents offer moderated airflow when an open window is too much. 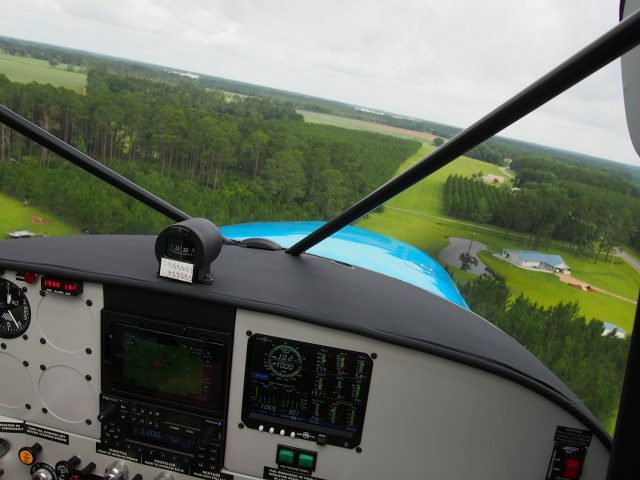 The Maule is a trim airplane: You’ll want to reach for the pitch trim wheel whenever you move the throttle. It also demands a heavy dose of right rudder on climb; maneuvering, you’ll want to lead the ailerons a little with rudder as well. Cruising speed does take about a 10-knot hit with the long legs and fat tires hanging below. At 24” manifold pressure and 2,400 rpm, we showed about 90 knots as we worked our way into a clear spot to climb up for stalls. Power on, clean, the stall broke at about 40 knots indicated with a mild left wing drop. With full flaps, the power-on stall still dropped to the left, but the airspeed indicator wasn’t much help at that point. Power off and clean, the roll to the left tamed a bit more. With flaps out and power off, it wouldn’t break. Between the vortex generators and a forward CG, there just wasn’t enough elevator to force the stall, and we settled into a fairly stable sink, just below 35 knots, interpreting between the airspeed indicator that was showing zero and the GPS groundspeed, as the winds aloft were negligible. Approaches flown to two grass runways showed a comfortable approach speed of 50 knots with full flaps. On short final, slowing a bit and a little added power allowed a fairly steep approach angle. The sink rate became apparent once near treetop height, which is easily arrested with a judicious flare. but I am afraid about bit much drag from this capable undercarriage. Perhaps one could rather use a tubing like the wing struts reducing quite some drag. But my point of view is from Germany, and we pay for a gallon of avgas at least the equivalent of US$ 10.00.